Ever since I started on Instagram (almost 3 years ago now) I’ve been influenced in one way or another. My sense of style has changed and even my home has been injected with new textures and colour thanks to those accounts sharing their love for fashion & interiors. I guess I saw Instagram as a way of escaping my safe style, seeing women of a similar age experimenting with different trends excited me! I do think there is a fine line between being influenced and copying though. It’s so easy to look at a large account with a huge following and want to emulate their success, they are after all influencing us but does that make it ok to try and copy them? And is there such a thing as original content anymore? We are subjected to so many images now that surely inspiration is almost subliminal! I love Fran’s style, for me she always gets it right! I absolutely loved how she’d made such a basic piece look so chic and really wanted to try to recreate her look! 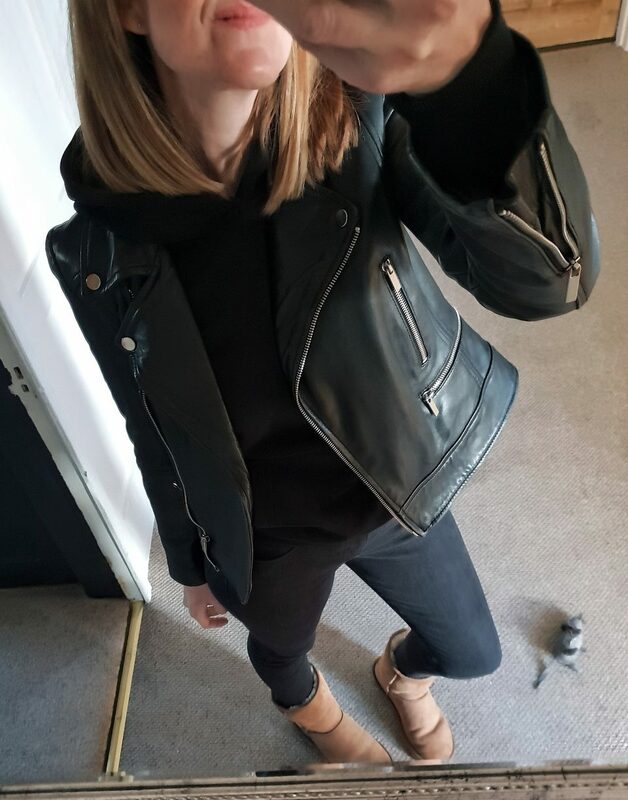 After a few failed attempts at copying her outfit I popped on my biker jacket and the look suddenly felt more me, but when I shared my outfit I tagged Fran as my original inspiration. I know this is only a personal opinion (hey that’s what my blog is for!) but I’d love to know your thoughts on this! Do images online inspire you and if they do, do you think its important to share where your inspiration came from? In a nutshell: yes, I do get inspired- sometimes rather obviously, other times more subliminally, but in much the same way as when I worked in (massive) office environments and clock someone looking super stylish, making a mental note of it to ‘try sometime’ – I pretty much use Instagram in the same way. Last night I posted a pic of myself in a cardi which I’d been influenced into buying but forgot to credit my inspo, so used insta stories to post a inspo credit instead which was appreciated. Like Andrea said, there are some very inspirational people on insta (you’re one of them! ), and lots of samey ones. You’re fabulous & I love your individual style – clothes & interiors wise. Personally, I get most of my inspo from seeing people out & about, in magazines & films / TV. I love insta for the banter though – you can’t beat it! God, I can barely get dressed without Instagram. I like to think I have my old favourites but if I’m struggling with what to wear then I go straight to Instagram! Remember the Boohoo sequin skirt? I would never have thought of wearing that. I’m definitely influenced! One of the first accounts I always check. I love your understated simple, yet elegant style. And I’m afraid I shamelessly do copy (especially you), but always try to compliment the originator. Your interior design has given me pause for thought away from the constant grey and pale colours that I coveted and which are in abundance on IG to more richer, outside the box colours. Thank you for influencing me, thank you to IG for giving me the opportunities to copy and for helping me keep my style and enjoyment for fashion (even when I can’t afford it) alive.